Residents learning laparoscopic colonic resections. Is it safe? Background: The learning curve in laparoscopy is usually associated with higher morbidity and conversion rate. Because laparoscopic colonic resection is a complex procedure it is commonly believed it can not be included in a general surgery program training. Aim: The aim of this study is to analyze the learning process of residents who perform laparoscopic colon resections and evaluate if it is done safely. Methods: 290 procedures were carried out between July 2000 and September 2005. Left and right colectomies as well as intestinal reconstruction were included. Other complex surgeries were excluded because they were not routinely perform by residents. It was felt that surgeons were comfortable with the procedure after performing 30 resections. To evaluate the experience of residents performing these surgeries under supervision and to compare this experience with that of staff surgeons who began to do laparoscopic colonic resections without assistance, the series was divided in three groups: 1- Staff surgeons during their learning curve without supervision; 2- Staff surgeons who have completed their learning curve; and 3- Residents operating under supervision. Groups 1 and 2 are integrated by two colorectal surgeons with previous experience in basic laparoscopic surgery. Group 3 is composed by 7 residents in their last thee years of their residency program who performed a mean of 7.1 (1-22) laparoscopic colectomies. Statistical analysis was performed using ANOVA and chi square tests. Results: 178 surgical procedures were included. Sixty (33.7%) in group 1; 68 (38.2%) in group 2 and; 50 (28%) in group 3. There were no differences in age and gender within the groups. Surgery indicated for cancer was significantly higher in group 2 [group 1, 2,3: 16/60(26.6%) vs. 35/68(51.4%) vs. 17/50(34%); p= 0.01)]. There were no differences in the conversion rate nor intraoperative complications among the groups. Surgery took longer in group1 (223.5±60.3 vs. 170±49.8 vs. 168.8±50.8 minutes; p=0.0001). The length of hospital stay was significantly greater in group 1 (3.9±1.8 vs. 3.4±1.6 vs. 3.1±1.9 days; p=0.05). There were no differences in postoperative complications among the groups. 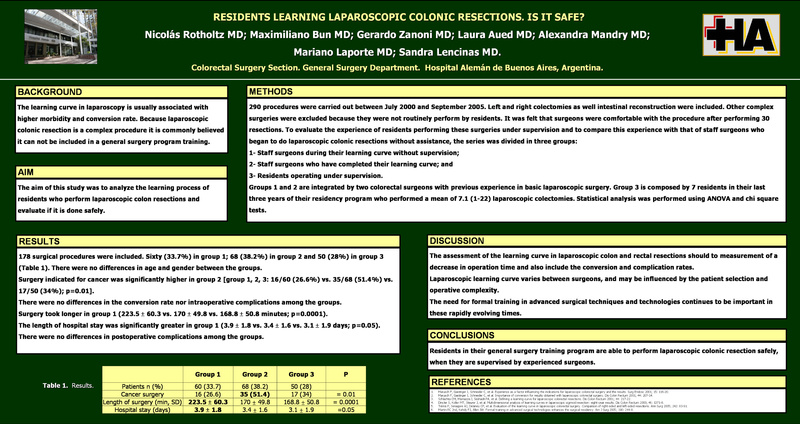 Conclusions: Residents in their general surgery training program are able to perform laparoscopic colonic resection safely, when they are supervised by experienced surgeons.